Are you trying to decided whether you should get hair extensions, or are you wearing them and are very disappointed? 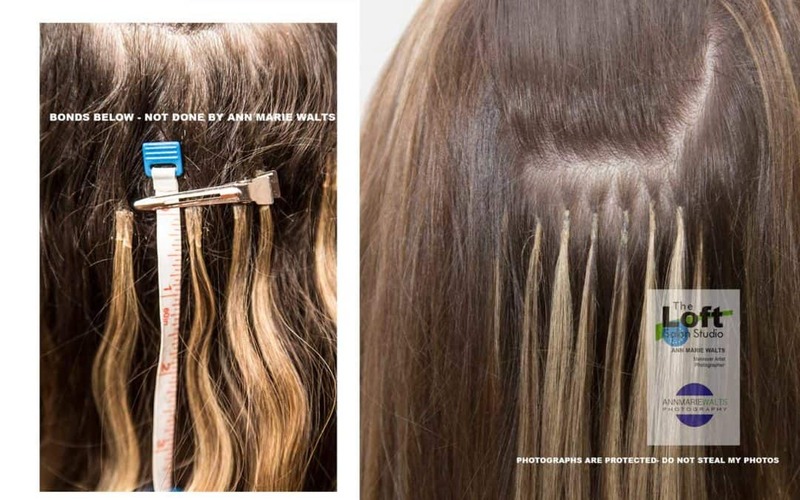 Improperly applied hair extensions are the most expensive extensions. A poor application can cause headaches, and stress on your fine hair. My heart goes out to you when I, as a professional, have worked with many, many fine haired clients who are so very disappointed with their hair. Your fine hair struggles can be fixed, but need to be handled with care, and especially when getting hair extensions. What you want to do when seeking out a salon, for hair extensions for fine hair, is to be sure that they can show you actual photographs. I professionally feel that one, if not the most important part that you are paying for is how the extensions are attached, and how neatly & safely the hair extensions are attached. It is said that, “YOU GET WHAT YOU PAY FOR”. I know that I can only speak for myself, and my business; however much of my business has consisted of fixing poor applications from lesser experienced situations. The correction photograph shows bond attachments that were too big and too much hair was applied. It is great to want to have longer and thicker hair, but not at the cost of safety. You do not want to stress your own hair out. The correction- Done by Ann Marie Walts. The photographs shown are examples of my work. This typed of customized bonding is referred to as “micro-bonding”. The amount of hair being attached should never weight more than the section of hair that it is being attached too. Why Choose? Loft Salon Studio? 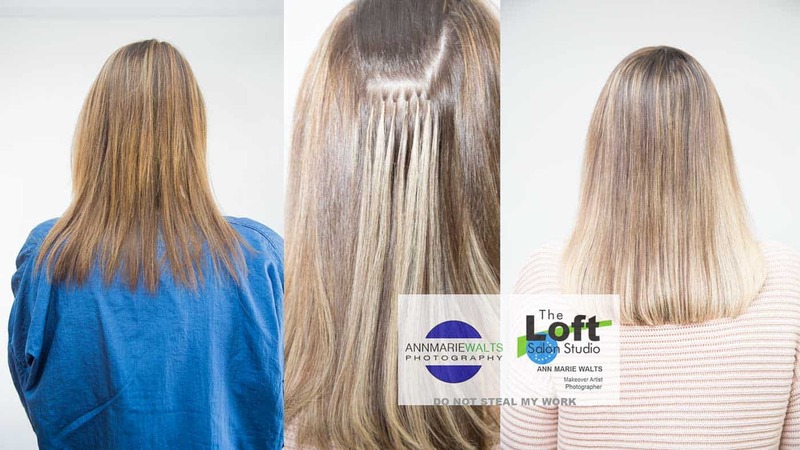 It is extremely important to work with a hair salon that offers hair extensions on a regular basis, and can offer you a very detailed consultation. I have been certified with Great Lengths Hair Extensions for 11 years! They had the best education, out of all of the the other brands that I hold certifications. Hair extensions take time. There are different types of applications.